III-6 Question: Since the Democratic Progressive Party came to power and since early 2007 in particular, it has unveiled a series of "de-sinicization" activities in Taiwan. How does the Chinese mainland view these activities? What stance will it take toward the possible extreme moves of the "Taiwan independence" secessionist forces? A: Over recent years, leaders of the Taiwan authorities have refused to accept the one-China principle, denied the "1992 consensus" and advocated such separatist propositions as "one country on each side." They have pushed forward their process of "gradual independence of Taiwan" by trumpeting de-sinicization and rectification of Taiwan's name, and even put out a timetable for "Taiwan independence." All these have seriously eroded the foundation for closer cross-strait relations and posed a grave threat to peace and security in the Taiwan Strait. The separatist moves have not only damaged cross-strait ties but had a disruptive impact on Taiwan's economy and society. 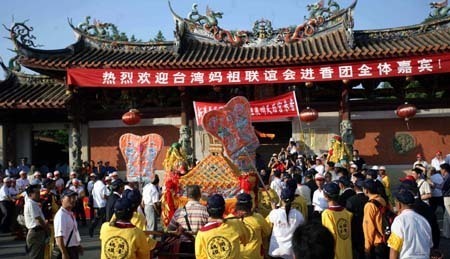 Chinese civilization has a history of several thousand years. It is not only the pride of the Chinese nation, but an important part of human civilization. The attempt of "Taiwan independence" secessionist forces to sever the blood ties between Taiwan and the mainland through "de-sinicization" and "name-rectification" movements is bound to be unpopular. We will never allow any change to history, reality and the universally recognized legal status of Taiwan. That is, Taiwan has been an inalienable part of China's territory since ancient times. Throughout the history of the Chinese nation, unity of the country has always been the mainstream, the overall trend and what the people aspire to. The peaceful development of cross-strait relations is not only the common wish of compatriots on both sides of the Taiwan Strait, but the general expectation of the international community. We are watching closely attempts the separatist forces in Taiwan are making for "Taiwan independence." We are firmly opposed to all forms of "Taiwan independence" activities, and will tolerate no one trying to separate Taiwan from the rest of China in any fashion. Meanwhile, we will make every effort to promote peace and development across the Taiwan Strait and continue to implement policies that are conducive to the peaceful growth of cross-strait relations. We firmly commit ourselves to peaceful development of cross-strait relations and dedicate our utmost to such a prospect with maximum sincerity.